The Vegan Vortex supper club is holding a raw food dinner at The Vortex jazz club in Gillett Square, Dalston on Weds 11th March. £18 gets you 3 courses, including Cauliflower rice Tabbouleh, and Sprouted buckwheat pizza slice, plus there will be lots of juices and smoothies to buy. There are two sittings, at 6.30pm and 8.30pm - full details below. "Join Vegan Vortex for our fourth delicious monthly three course vegan dinner, hosted at the Vortex Jazz Bar in Dalston! This March we will be hosting another evening of serving up three raw plant-based and nutrient packed delightful dishes. 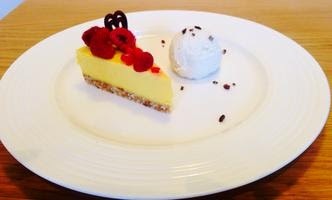 You will taste a starter, main and dessert crafted from raw vegan and gluten free ingredients (which are locally sourced/organic where possible). We purchase ingredients from Growing Communities in Hackney to support local vegetable farms. If you wish to come, booking is essential via Eventbrite to secure your table! The menu is designed and prepared by Emily Stephenson, head chef of new London-based catering company, Vegan Delights. Emily is a professionally trained vegan chef whose experience comprises michelin-starred restaurants alongside vegan SAF and The Wild Food Cafe. Marcus Perkins, a lifelong vegan, chef and food enthusiast, works with her to produce dishes of high quality and standards. To suit people on all schedules, the evening will have two sittings; 6.30pm and 8.30pm. We hope to see you there! Starter: Cauliflower rice Tabbouleh, sunflower seed garlic sauce, freshly marinated cucumber ribbons, Sauerkraut and hemp seeds. Main: Sprouted buckwheat pizza slice with tomato marinara sauce, pumpkin seed cheese, pesto, caramelised onions and fresh rocket. Dessert: Raw sweet mango cheesecake with coconut ice cream. There will be a small selection of juices and smoothies to purchase from The Vortex Downstairs bar on the night. Furthermore, there will also be organic wines, beers, soft drinks and hot drinks to purchase if you would like them."